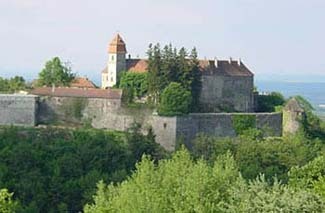 In the foothills of Austria’s eastern Alps, just before the landscape gently unfolds onto the Hungarian plains, the noble castle of Bernstein has stood sentry since the ninth century. Assaulted, blown up, and even struck by lightning during its 1000-year life, Bernstein’s numerous owners (including an Irishman!) have maintained the castle’s architectural integrity. From the 13th to the 19th century, Bernstein held capital jurisdiction in the area. If you’re interested in justice of the Middle Ages, take note of the pillory post on the village square and the castle dungeon—complete with manacles, rack, and whipping bench. In the 16th century, the Turks laid siege to the castle twice but were never able to capture it. Hotel Burg Bernstein is one of Austria’s most authentic castle hotel experiences. If you love atmospheric, family-run accommodations, this is a great choice. I like the idea, too, that Burgenland is a relatively unexplored region of Austria, easy to get about by car. Bernstein is 100 km south of Vienna. Although the town of Bernstein is served by bus from Vienna, a car is the most practical means of getting around. A hotel since 1953, Burg Bernstein offers guests a warm welcome and a fascinating glimpse into traditional Austrian life. Passed down through the same family for generations, the Berger-Almásy family present the castle more as a large home rather than as an impersonal hotel. The ten keyless, baronial guestrooms bear names not numbers. Instead of televisions, mini-bars, and telephones, priceless antiques fill the rooms. During winter, ceramic Austrian stoves keep the air cozy and warm. Bathrooms are modernized. Dinner in the beautiful baronial hall is cooked by Mrs. Berger-Almásy herself. A resident ghost exists! One of Bernstein’s former medieval lords returned home from war one day to find his young, beautiful wife in bed with a servant. In rage, he walled her up inside her bedroom to die. She is said to be a friendly ghost who doesn’t upset the guests.